A teenager has been arrested on suspicion of inciting religious hatred after allegedly burning an English language version of the Koran. The 15-year-old, who lives in the West Midlands, allegedly posted the video, filmed two weeks ago on her school premises, on Facebook. The video was reported to the school and subsequently removed, police said. A 14-year-old boy was arrested on Tuesday on suspicion of making threats. Both have been released on police bail. It is thought the girl, who lives in the Sandwell Council area, was allegedly filmed setting the booklet alight while other pupils watched. Two Facebook profiles have also been removed from the site, police added. It is understood that the group who published that version of the Koran have since been to the school to talk to pupils. 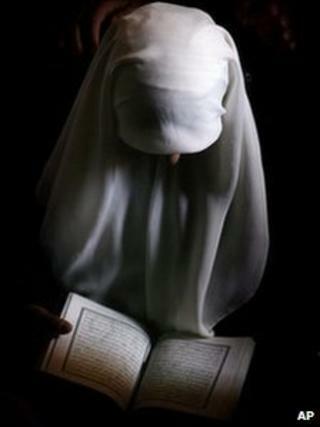 She said: "The Koran is the most sacred thing to over a billion Muslims worldwide." "You can see that in the way Muslims treat the Koran, washing before touching it and in many Muslim homes you will find it on the top shelf above all other books and we will never destroy the Koranic texts." "We believe it is the word of God. God's guidance for us in this life," she added. Bob Badham, Sandwell Metropolitan Borough Council cabinet member for education, said he had visited the school and believed the atmosphere was generally good among pupils. He added that he did not believe there was a "deeper problem" in the area.